Talisker 25yo 2004 release (57.8%): Well, just decided that I really don't have to wait for a good reason to sample this guy. It was sitting on my desk since our peaty whiskies tastings. Today is Friday and the weather is beautiful outside. What else do I need? Although I still have an unopened (and not reviewed) bottle of of Talisker 25yo 2005 edition in my cabinet I am pretty excited about this 2004 edition since they are pretty hard to find and to be honest more favored among other 25yo releases. It's bottled from refill casks and the sample is filled from the bottle number 20160. Color: Yellow gold, heavily oaked Chardonnay. Nice thin legs. Nose: Canned ocean spray..! And a giant chilled fruit bowl: Pineapples, oranges, white grapes and strawberries. Fresh apricots and guava. Candle wax... In a blind tasting I could put serious money on, it's being a very old Brora. More sea salt, wet beach sand and cold seawater. Sweet and subtle peat with scraped vanilla beans. Water pulls peat a little more forward. It's less coastal more grassy now. Green hay, lime juice and tonic water. Palate: Hot but packed with flavors without adding water. Black pepper, roasted chestnuts and bike tires. Water helps a lot. 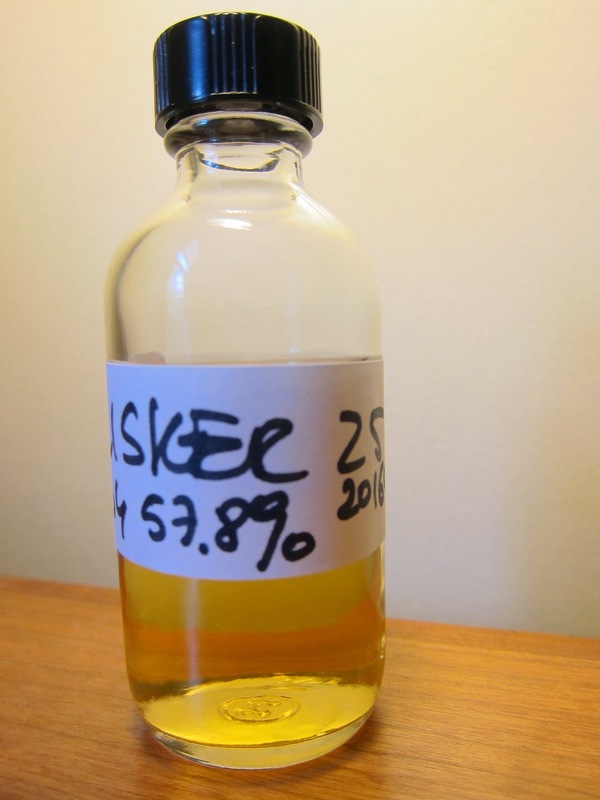 Sherry cask notes surface for the first time: raisins, wool, nutmeg, medical rubber tubing and nice dry oak. Odd, still tastes like a Brora to me. Well, after a while peat starts to grow and black pepper corns start to sizzle on the palate. Talisker is taking over now. Old thick leather jacket and wet cigar butts. Finish: Long with black pepper, orange zest, lime slices and sweet soot. Overall: Nice one... Definitely way more muscular and punchier than the newer Talisker 25yo. releases. I like how still vibrant and not tired it is. Thanks to the refill casks... Should I save some to compare with the 2005 release or just drink it all..? You know what? It's a no-brainer. I will drink it all. It's a nice whisky and like I said before it's Friday and the weather is absolutely gorgeous... Thanks to Dave Russo for the sample.